It was nearly a century before Abraham Lincoln. And it was one of the “bad guys,” John Murray, Earl of Dunmore, Royal Governor of Virginia, who issued it. 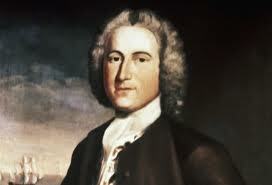 Lord Dunmore freed the slaves of the Royal Colony of Virginia on November 7, 1775. John Murray, Earl of Dunmore, Royal Governor of Virginia, 1771-1775. That date is tucked away in the chronicles of American history like a guilty secret. Maybe it’s because we really don’t want to acknowledge what motivated many American colonists to take up arms against England. It was the need to preserve slavery. It was the wealth of the plantations, wealth only made possible by slave labor. It was all about the money. Dunmore’s Proclamation was issued from a British warship in Yorktown harbor. 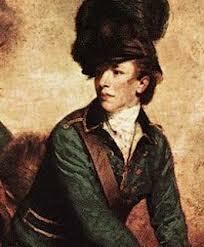 He had fled there in April after the colonists surrounded his royal palace in Williamsburg, the colonial capital. They were furious that he had effectively disarmed them by removing the colony’s supply of gunpowder from the public magazine and storing it in another British ship. It was the day after the Lexington and Concord clashes in Massachusetts. The Virginians didn’t buy Dunmore’s initial excuse that he was safeguarding the powder from potential seizure by rebellious black slaves. The November proclamation by Dunmore offered freedom to slaves who would rebel and take up arms against their masters. Some 800 to 2,000 did so, becoming his “Ethiopian Regiment” in the early stages of the war. They had some initial success in the Chesapeake area, but later on were evacuated to New York to fight there. Like Lincoln’s Emancipation Proclamation, Dunmore’s move was just a war measure, intended to incite rebellion and bring disorder to the enemy. But it backfired, with disastrous results. Virginia and the rest of its Southern brethren were now in the rebellion to stay. Hundreds, if not thousands, who had been undecided enlisted in the Continental Army. Nothing did more to turn the South against the Crown than the Dunmore Proclamation. The Revolution needed the Southerners. It especially needed Virginia, the largest and wealthiest of all the colonies. 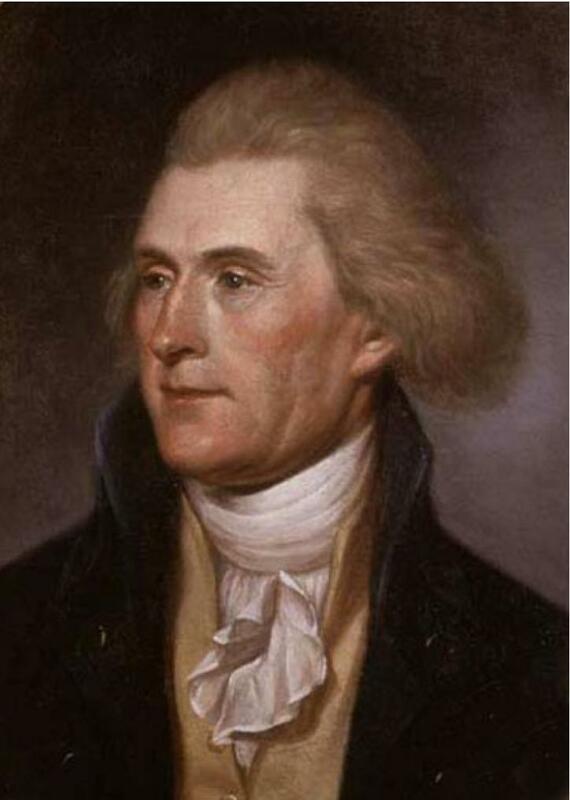 That is the main reason that Thomas Jefferson was picked to write the Declaration of Independence. John Adams, for one, insisted on it. And so it was. But Virginia would most likely never have been there, had Lord Dunmore not attempted to free the slaves first. British authorities never repudiated Dunmore, even though they must have realized that his declaration did not have the intended effect. In 1779, British General Sir Henry Clinton’s Philipsburg Proclamation freed slaves owned by Patriots throughout the rebel states, even if they did not enlist in the British Army. That second Emancipation Proclamation prompted about 100,000 slaves to try to leave their masters and join the Brits over the course of the entire war. And at the end of the war, the British relocated about 3,000 former slaves to Nova Scotia. This wasn’t much, compared to the total slave population, but more American slaves were freed by the British than in any other way until the Civil War. Britain also had an admirable conversion to the cause of abolition in the ensuing decades, again well before the days of Abraham Lincoln. The plight of the slaves became better known to people in the mother country as a result of the Revolutionary War, and public sentiment turned against it. The conversion took a few years, and not before British Colonel Banastre Tarleton made himself a fortune in the slave trade after the war was over. 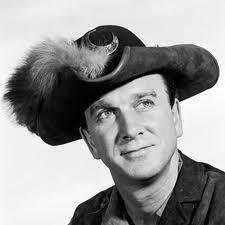 Boomers who were fans of Leslie Neilsen, “The Swamp Fox” of Walt Disney’s shows about guerrilla fighter Francis Marion, will remember Colonel Tarleton as Marion’s primary military foe in the Carolinas. Britain abolished its slave trade in 1807, and the Royal Navy began an anti-slavery patrol of West Africa in 1808. Between then and 1860, the West Africa Squadron seized approximately 1600 ships involved in the slave trade. They freed 150,000 Africans, almost all of whom had been destined for plantations in the American South. So, taking the long view, the First Emancipation Proclamation by Lord Dunmore was a short-term failure. But it set in motion a chain of events that were ultimately beneficial, even though there was much suffering along the way. The Emancipation Proclamations. More than one of them. And now you know the rest of the story. 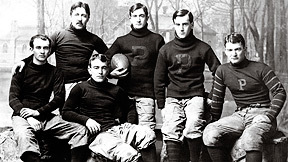 Princeton football heroes (L-R) Arthur Poe, Samuel Johnson Poe, Neilson (Net) Poe, Edgar Allan Poe, Gresham Poe and John Prentiss Poe Jr. When Bill Belichick was drawing up his game plan for the American Football Conference championship game with the Baltimore Ravens, his eyes most surely had “all the gleaming of a demon that is dreaming.” Bill’s teams have established a winning tradition for professional football that will be difficult to match. Still, whatever that particular game’s outcome, the New England Patriots have to go a long way to match the sporting, cultural, and military traditions of the relatives of Edgar Allan Poe. Edgar was born in Boston in 1809 and died in Baltimore in 1849. “The Raven” was his most famous poem. Published in 1845, it gave Baltimore’s current professional football team its nickname. But “back in the day,” college football was king, and the mighty Harvard and Yale elevens perennially fought for national supremacy. The special nemesis of both the Crimson and the Elis were the Tigers of Princeton. And the most renowned of the athletes who played for Princeton were the six Poe brothers, all sons of Edgar’s cousin John Prentiss Poe. They all played football in college, and three of them served with distinction in World War I.
Samuel Johnson Poe, Class of 1884. He played halfback for the Tigers in 1882-83. He was also an All-American lacrosse player. Edgar Allan Poe, and college football’s first All-America quarterback. Edgar Allan Poe, Class of 1891. 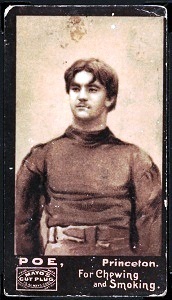 Probably the best known of all the Poe boys, he was the country’s first All-America quarterback, chosen in 1889, when Caspar Whitney of Harper’s magazine selected the first All-America college football team. 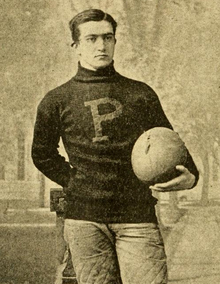 Edgar was captain of Princeton the team as a junior and as senior. One story goes that after Princeton beat Harvard 41-15, a Harvard man reportedly asked a Princeton alumnus whether Poe was related to the great Edgar Allan Poe. The Princeton guy replied, “He is the great Edgar Allan Poe. '” The younger Edgar Poe graduated Phi Beta Kappa and later served as the Attorney General of Maryland from 1911 to 1915. John Prentiss Poe, Jr., Class of 1895. Perhaps a typical “third child,” with both a reckless courage and a generous nature, he was a star halfback on the football varsity and class president. When he flunked off the team the next spring, his whole class turned out at Princeton Junction to see him off. He was readmitted in the fall, played even better, but again had to leave for academic reasons. This time he did not return. He set off on a series of adventures, coaching football at other colleges and working as a cowpuncher, gold prospector, surveyor, and soldier of fortune. When World War I broke out he hastened to England and “took the King’s shilling” as a private in the Royal Garrison Artillery. He later applied for transfer to the infantry and was assigned to the 1st Black Watch. That famous Scottish infantry regiment was known to the Germans as the “Ladies from Hell” because of their ferocity and the kilts they wore. John died in the Battle of Loos in September of 1915. He was with a detachment carrying bombs to another regiment and was part way across an open field when he was struck in the stomach by a bullet and killed. He was buried there, between the German and British lines, and relatives were never able to locate his grave. 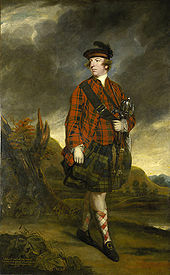 His portrait, showing his stocky figure with the kilts and bonnet of the Black Watch, hangs in Madison Hall; it was given by the Princeton Alumni Association of Maryland. Poe Field, provided in his memory by classmates and friends, is used for lacrosse and intramural athletics. The John Prentiss Poe Football Cup, given by his mother, is Princeton’s highest football award. Now known as the Poe-Kazmaier Award, it goes annually to the member of the varsity football team who has best exemplified courage, modesty, perseverance, and good sportsmanship. Neilson (Net) Poe, Class of 1897. He played in the backfield in 1895 and 1896, and later came back and coached. In World War I he was a lieutenant was in the U.S. Army’s American Expeditionary Force, the “Rainbow Division.” He was wounded in a 1918 battle in which his commanding officer was killed. Neilson took command and safely entrenched his men for 24 hours while suffering a bullet wound to the stomach and several shrapnel wounds. He was later awarded the French War Cross and the Distinguished Service Cross. 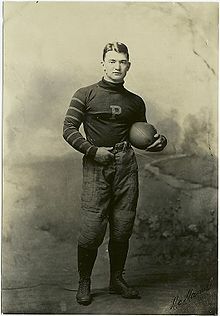 Arthur Poe, Class of 1900, was another All-American. He scored the deciding points in two consecutive victories over Yale. In 1898 he ran ninety yards for a touchdown and the only score of the game. Newspapers reported that he had recovered a Yale fumble, but Poe said that he had grabbed the ball from a Yale halfback’s arms, that he had a clear field and a ten-yard start for the goal line, and that he had never felt happier in his life. Gresham Poe, Class of 1902, was a substitute on the Princeton varsity in 1901. He was in a field artillery unit in the U.S. Army during the war. Gresham wasn’t quite the athlete that his older brothers were. 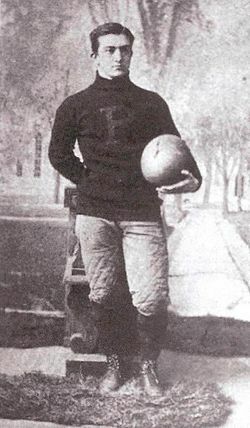 He was inserted late into the 1901 game against Princeton to return a punt, and he received a loud ovation from Princeton fans. The Elis won that game 12-0, but they were prepared for yet more Poe family heroics against them too. Winning goals are kicked galore. Finally, we should note that Edgar Allan Poe’s son, Edgar Junior, also graduated from Princeton and fought for his country in World War I. He never played football, but he too carried on the tradition of service of that admirable family. He was a U.S. Marine lieutenant and was severely wounded, but survived. So I ask – when will there be a New England football family that matches or surpasses the traditions of football prowess and military service of the Poes of Princeton? In 1995, on the occasion of the last Beanpot Tournament to be played in historic Boston Garden, I was featured speaker at the annual Beanpot Press Luncheon. Here’s what I had to say at that time – about what the Beanpot means to me and to the city, and about why it will always be special, and uniquely Boston. This is one of my all-time favorite addresses. I’m honored to be allowed to address you today. This is the last time we’ll be gathered for our Beanpot Luncheon in the House of Magic, as Eddie Powers used to say. We all have so many memories from this building. I’m not going to do much personal reminiscing about Beanpots past, though. I have a much bigger message. I have some thoughts about Boston. About this tournament. About its mystique. Its grandeur. Its irresistibility. I would like to tell you my biggest Beanpot thrill, however. On that wild overtime night, back in 1980, Alan Segal and I were on the air. I had the play-by-play mike when Wayne Turner scored his goal. Northeastern has won the Beanpot! After 29 years! And I told the world about it. That’s a big thrill, for people like me. There was another man on play-by-play that night. He probably told more people about it than I did. I want to thank him for all he’s done for Boston sports, and congratulate him on his retirement. Longtime Boston Bruins announcer Bob Wilson, would you please stand and be recognized? That was special. We all like to see the underdog win. But that goal was the most important in the history of this tournament. It made the Beanpot a four-team event. It brought Northeastern to a new level of prestige. It was level Northeastern hadn’t yet achieved, and which it’s maintained to this day. That goal re-made Northeastern hockey. We’re all better off for it. And I told the world about it. That was a thrill. But enough of my personal memories. Whenever Snooks Kelley took this podium, we all looked forward to him. And he said the same thing every year. The Beanpot is not just an athletic must. It’s a social must. And that’s true. There are people in Boston who come to the Beanpot who never attend another sporting event. I think I know why that happens. That’s my message. So no more personal reminiscences…although 1976…Richie Smith…going around Gary Fay for that shorthanded goal…Gary’s still got a bruise on his cheek where he fell down…one of two shorthandeds by BC that night…I was broadcasting that game too, with David Pearlman…another big upset, BC over BU…that was special But why is the Beanpot so special to Boston? The first time I read those words they just leapt off the page at me. That’s because when I was a little boy, I and my friends used to sneak into town from Winthrop on Saturdays and explore our city. Meet it up close and personal. I didn’t know what those street names meant then. But I know now. And nothing compares to Boston, for the sheer poetry of its street names. It’s just one of the things that made growing up in Boston so wonderful. And the greatest of these is the Beanpot Tournament. It’s the most essentially Boston, of all these four, for reasons that we’ll see. But let’s look at them. Fenway and the Sox. A field of dreams. It was in the movie. And well it should have been. You’ve all had the same dream I have. I dream of being Carlton Fisk. Only in Game 7, not Game 6. And when that ball goes off into the night, and the series crown comes back…finally, we banish the miserable ghost of Harry Frazee, and we welcome back the shade of the Bambino, back to where he really belongs…everybody from Boston has that dream. We’re all waiting together for it to happen. And some day it will. The Marathon. The most ancient of athletic events. Once a year, it happens here. On Patriots’ Day. That’s the day America was conceived, and they fired the shot heard ‘round the world. For the Boston Marathon now, the whole world turns its eyes to Boston. And all of Boston turns out, millions of us, to welcome the athletes of the world to our city. That’s Boston at its best. And it’s not just a race, the Boston Marathon. It’s a man. Old Johnny Kelley. The marathon isn’t over until Johnny finishes. And we all wait to welcome that man, forever young at heart. What an achievement. Over 62 years competing in that grueling test. We’ll never see his like again. Celtic pride. As old Johnny is to individual achievement, the Celtics are to professional team achievement. 16 world championships. Eight in a row. The Celtics always found a way to win for us. They won when they should have, and they won when they shouldn’t have. No matter how much they were up against it, the Celtics always dug way down, deep into the very soul of their team, and found a way to win. You might ask what all this has to do with a talk about the Beanpot. I think it has a lot to do with it. That’s because the man who owned the Celtics, the man who was ultimately responsible for all they were able to accomplish, was a hockey man. He was a founder of the Beanpot. He was a man for all seasons in Boston. Walter Brown. He was my uncle. I want to tell you about him. That’s true. And he never went to college. But by the peak of his career here, Walter was president and owner of the Celtics. President of the Bruins. President of the Garden. And president of the BAA. A man of sterling character, charitable to a fault. If ever any one man personified our city, if ever there was a First Citizen of Boston Sport, that man was Walter Brown. A hockey man, first and foremost. A brief digression. Boston has taken some hits, over the years, on the subject of bigotry. But here’s the Boston that I choose to believe in. Boston broke the color line in the National Basketball Association. It’s a bit hard to believe now, but that league had no black players until Boston, in 1952 I believe, drafted a man named Chuck Cooper. He was the best man available, and they took him. It wasn’t as courageous as Branch Rickey’s taking Jackie Robinson. But it was the right thing to do. And it cost the Celtics and Walter Brown a lot of money. That’s because Abe Saperstein, the man who owned the Harlem Globetrotters, was furious. He now had to compete for his players. He threatened to boycott Boston, and he did. Boston had to pass up those lucrative Friday night doubleheaders, with the Trotters playing the first game. But principle triumphed. The right thing won, over the expedient. That’s why, I think, that the Celtics were always able to reach down, further than any other team, and pull out those championships year after year. I am a firm believer that the good guys will win in the end. That’s what the Celtics did. That’s what I choose to believe about Boston. That’s the character of our city. And it was the hockey man who owned the basketball team, one of the men who founded the Beanpot, who showed us the way. But of all his accomplishments, I think Walter would be most proud of this Beanpot Tournament, and what it’s become. As I’ve said, he was first, last, and always a hockey man. Manager of the 1936 Olympic Team. Manager of he 1948 team. Owner of the Boston Americans. Hockey Hall of Fame member. President of the Bruins. [1995 Boston University captain] Jacques Joubert, you have his trophy. 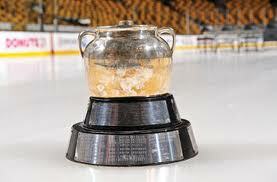 Second, because the Beanpot, more than any of our matchless traditions, literally is Boston. His city. Our city. All of the people who built this city, who made it the world class metropolis it is – even though we don’t have a megaplex – not only come to the Beanpot. They play in the Beanpot. And who are they? The men of Harvard are here. The people who came to these very shores first. The people who defined our American way of life. Boston is the education capital of the world. That’s because Harvard is here. Oh, there are others, but they all stand in line behind John Harvard’s school. Since 1636, the best and the brightest have gone to Harvard. They go there still. Wasn’t it only fitting that the first Beanpot champions were the men of Harvard? The Catholics are here. Boston College. My school. There is no group of people who have done more to shape and mold our city of Boston, since its founding, than the Catholics. In wave after wave the Catholic immigrants came to Boston. Uneducated, but devout and hard working. And when there was nobody else around to educate them, Boston College was here. Then there’s Northeastern. I like to call them the kids of the American dream. Because they did it all on their own. The hard way. It takes an extra year to put yourself through Northeastern. You study. You work. Then you study some more. And work some more. And by the time you’re through with the Co-Op program, you’re ready for anything that life could ever throw at you. Northeastern University has given Boston many thousands of graduates in all sorts of professions. But more than that, Northeastern has given Boston an outstanding work ethic. That’s Northeastern’s enduring gift to Boston. And there’s Boston University. And because this is the Beanpot Luncheon, after all, we save the best for last. And friends, I must confess that I couldn’t find a way to capture, in a capsule, the educational essence of BU. It’s a big, sprawling place. They’ve got everything there. All range and manner of grad and undergrad schools and programs. And maybe, just maybe, the educational character of BU has been eclipsed, from where I stand, by the incandescent personality of the man who runs the place. If you’ve got a question, the man who runs BU has your answer. And it’s always a good answer. And I want my friends from BU to know how very special they are. I’ve been a student in the Metropolitan College. My grandfather, George V. Brown, was your first athletic director. And you play your superb brand of hockey – the pride of the East – in Walter Brown Arena. You’re special to all of us who love the Beanpot too. 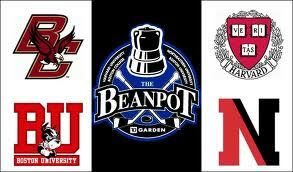 Just look at the Beanpot achievement of Boston University. As old Johnny was to individual accomplishment, as the Celtics were to professional team accomplishment, so is Boston University to college hockey and the Beanpot. Seventeen championships. 16 second places. In the title game 27 of the last 31 years. There’s no way to explain such a record. Like the Celtics, the Terriers win when they should. They win when they shouldn’t. It doesn’t matter if the coach is Parker or Abbott or Kelley. I think I know why that happens now. I think that the Terriers, like the Celtics, carry a little bit of Walter Brown with them. They skate down from Walter Brown Arena to Walter Brown’s beloved Garden and something wonderful happens. Celtic green has become Terrier scarlet. You wear it well, BU. And every time I see Boston University skate out onto the Boston Garden ice, the Boston College man in me says “Oh, God. 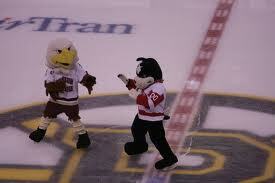 Here they come again!” But the Beanpot man in me, the Bostonian in me, just tingles with anticipation. I’m seldom disappointed. I know I’m going to see something grand. And so does everyone else in Boston, no matter where their allegiances lie. That’s what the Beanpot means to me, my friends. That’s what it does to me. That’s what it does to my city. Boston is indeed many things. The poetry of its street names. The education capital of the world. And Boston is the Beanpot. And the Beanpot is Boston. That’s why it’s a social must. That’s why it’s irresistible. That’s why we’ve all got to be there. Players. Coaches. Best of luck This is your time. Let’s make this Beanpot, the last one in the old Garden, the House of Magic, the Grande Dame of Causeway Street, one we’ll never, ever forget. Ladies and gentlemen, thank you for being with us this evening. Thank you for being part of what the Gridiron Club does – keeping alive the memories, standing up for all the tremendous good that comes from athletic competition, and carrying the flame of tradition. It’s especially good and important that you’re joining us tonight, at this point in the history of college athletics. I say that because it seems – to me anyway – that not everybody the sporting world still values tradition as highly as it should be valued. Let me give you an example. “Maryland, My Maryland.” Don’t you love that song? I get goose bumps when the Naval Academy Glee Club sings it before the post parade at the Preakness. It’s a very nice musical rendition – set to the tune of “O Tannenbaum” – of a long poem that is not so nice. In fact, it may be the most militaristic and warlike piece of poetry every written by an American. Maryland and Virginia. The Old Line State and the Old Dominion. They’ve been sisters for hundreds of years. And whatever side you might have taken during the Civil War, you’ll probably agree with me that they belong together. Virginia should not call in vain. But now she will. 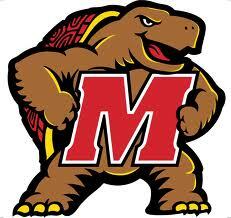 When she calls to Maryland from the football field, there will be no answer. Maryland will be out somewhere in the cornfields of Iowa. Maryland and Virginia first played football in 1919, and had a game every year since 1957. No more. Tradition? Who needs it? If you’ve never been to College Station, Texas, put a Texas A&M football game on your bucket list. It’s a happening. It’s only 85 miles across the plains from Austin and the University of Texas. 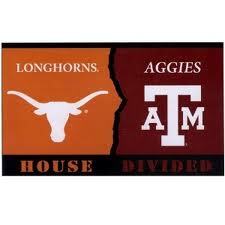 Up until 2008, Texas A&M and Texas had faced each other 117 times on Thanksgiving Weekends. It was a rivalry more fierce than any that we laid-back Northerners know. 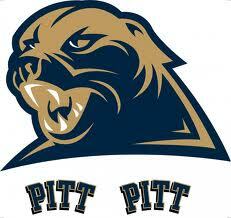 How about the Back Yard Brawl between Pitt and West Virginia? Fans travel just 70 miles along the Monongahela to see this game. For how many generations have the coal fields of West Virginia fed the blast furnaces of Pittsburgh? They belong together too. In football, the universities have played 104 times. 14th oldest rivalry. No more. Kansas- Missouri. The Border War. In 2007, the universities decided they didn’t like the name of the game and changed it to “Border Showdown.” This rivalry harkens back to pre-Civil War days and “Bleeding Kansas.” The Civil War really began out there, years before Fort Sumter and Bull Run. The teams even got their nicknames from that era. 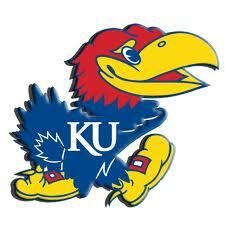 Jayhawkers were originally characters that included abolitionists, military regiments, robbers, and murderers. In the years following the Civil War, the term became synonymous with native Kansans. The Tigers were a home guard unit that protected Columbia, Missouri from marauding guerrilla bands. Kansas-Missouri was college football’s second-oldest rivalry. 120 games. Gone. Nebraska-Colorado . First met in 1898. Total games – also mostly around Thanksgiving – a mere 69. That’s over now, too. 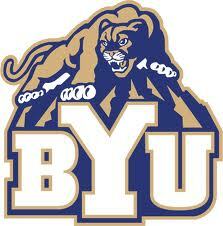 Brigham Young-Utah. The Holy War. First played in 1896. 94 total games, and every year since 1946. They will play in 2013 and once more in 2016. But that’s it. I’m sure there are many more such stories, and not just in football. There’s going to be a lot of prosperity created in the coming years – when college leagues break up, and re-form, and have playoff games, and sign new television contracts, and establish even more networks. But I’m not sure that we’ll be any wealthier, after all that. There’s a richness about life that can only come your way through friendships, and family – and through those traditions and rituals that anchor you in the world and define who you are. So it is in sport. But we’re seeing many of those traditions disappear. That can’t be a good thing. That’s why I say that your presence here, in the body as well as in spirit, is so important. That you sit in the stands, and come to the games in person, and now, that you are present for the well-deserved accolades and recognitions…You’re doing your part to preserve tradition – perhaps more than you realize. So thank you again, for being with us at the Bob Whelan College Awards Night. We always appreciate your support. Especially this year. You are currently browsing the Veteranscribe's Blog blog archives for January, 2013.